Artworks today enter digital markets of circulation. Even the seemingly dematerialized, non-commodifiable works of land art and conceptual art are subject to economies of reproduction and intellectual property. The contours and cracks of these networks inform four very recent artworks in The Wired, an exhibition currently on view at the Alice F. and Harris K. Weston Art Gallery street-level space. Curated by C.M. Turner, this exhibition explores the interweaving of physical, digital, and intellectual concepts of art objects and property in the contemporary art economy. Façade, a sculptural installation by Future Retrieval (Katie Parker and Guy Michael Davis) and Jordan Tate melds found objects and facsimiles. 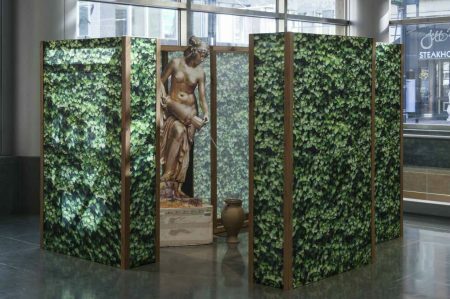 At Weston, the work’s panels of wood and fabric printed with photographic depictions of leaves are installed as a small room. Much like in a European pleasure garden, one must enter into the opening in the hedges to encounter a sculptural work and water feature. Only here entering the inner space makes the artifice painfully obvious as we confront the back of the printed panels and a two-dimensional plastic cutout of a classical Greek fountain statue. Surprisingly the cutout is a functioning fountain and emits running water into a real ceramic vessel of the same style as the one held by the photographed sculpted goddess. The interplay of two and three dimensions, of actual and representational art objects, is at first rather pat and obvious, but becomes further complicated by the base: a shipping crate covered with Chinese postage and stickers. This detail embeds the work in global circuits of luxury objects, cheap imitations, and labor, making an otherwise unremarkable piece more memorable. 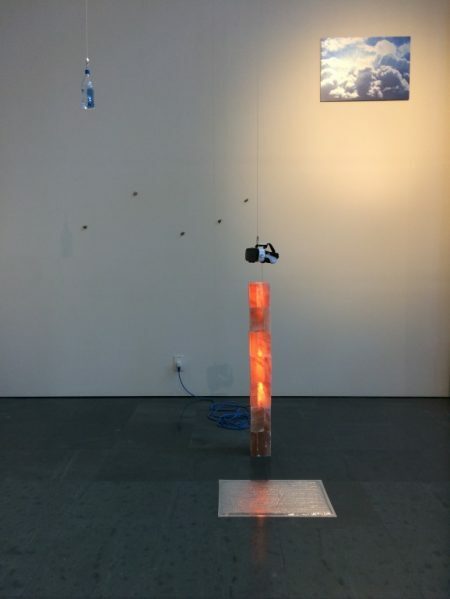 Caroline Turner and Ian Anderson similarly play on the spaces between representations and objects with a four-part sculptural, photographic, and digital installation Always the Dream. The wall piece The Origin of a Node-Based System and the pedestal sculpture An Occurrence of 84 Trace Elements (most notably calcium, magnesium, potassium, copper, and iron) attempt to ground the installation in geologic, material time and space, alluding to the earth in both their physical appearance and titles. Also on the wall hangs Always the Dream 1.0, a print of a blue sky and clouds on brushed aluminum, and just above the pedestal dangles a virtual reality headset featuring Always the Dream 2.0. The headset is suspended via a pulley system counter-balanced by a bottle of “Eternally Natural Alkaline Spring Water,” another physical and linguistic play. Stepping onto an aluminum insulation mat, I donned the headset and looked out at an endless field of computer servers. The servers extend as far as the eye can see arranged in a perfect grid, like a compressed version of Walter de Maria’s Lightning Field (1977). While this evocation of the physical spaces of immaterial, digital information through virtual spatial immersion is provocative, the VR headset’s juxtaposition with the other photographic and sculptural aspects of the installation and the linguistic plays on titles and labels makes the total installation seem conceptually forced and aesthetically disjointed. The allusion to land art in the VR component of Always the Dream is central to two works by Justin Hodges and Casey James Wilson. In many ways these works anchor the exhibition and introduce more complex conceptual gestures than the first two. 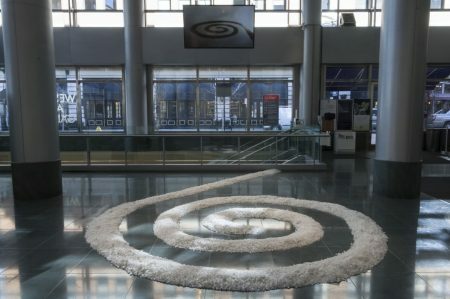 In One More Jetty, a rock salt model of Robert Smithson’s canonical earthwork Spiral Jetty (1970) interrupts the gallery floor and sits below a screen with various filmic and digital documentation of the original work on the Great Salt Lake in Utah. The video oscillates between different modes of engagement with Spiral Jetty: footage from Smithson’s original film documenting his earthwork, new high definition footage of the jetty shot both from above with drones and on the ground with hand-held cameras, images of smaller rock models like the one in the gallery, and screen captured navigation of the site via Google Earth, complete with other Chrome tabs and computer desktop in the frame. Shifting between archival and recent documentation of the site as well as digital and sculptural virtual jetties destabilizes the representations of Spiral Jetty just as Smithson’s Non-Sites destabilized the relationship between the gallery and the outside world. Just before his practice expanded to working with earth itself, Smithson would bring rocks gathered from sites (most often in his native New Jersey) into the gallery. The artist placed the earth in minimalist-inspired sculptures on the floor while hanging an aerial view of the site of excavation overlaid with the same shapes that grace the floor on the wall. The interplay of sculpture and photograph, of art material and actual earth, ruptured the separation between the neutral space of the gallery and the actual space of the site. Similarly, Hodges and Wilson create an interplay between sculpture and video in their work, and even between jetty and water in the material used to construct their model. As it is installed at Weston, one must simultaneously look out onto the street to view the sculpture and video simultaneously, further blurring the lines between site and non-site. Land art also forms a conceptual catalyst for A Line Made by Growing, Hodges and Wilson’s other contribution to Wired. 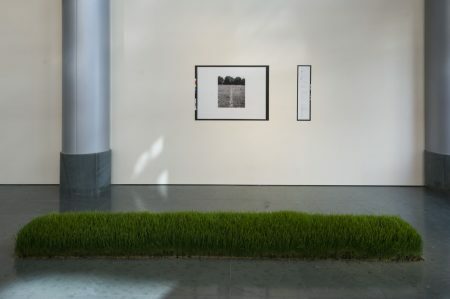 This three-part installation features a narrow strip of grass and two wall-mounted inkjet prints on vinyl. The work’s title refers to Richard Long’s A Line Made by Walking (1967), another example of early land art, only Long’s line was ephemeral and tied to performance. The line of living, growing grass in the gallery space reverses Long’s indentation in the landscape by creating a space in the gallery where we cannot walk. One of the two prints on the wall is the most often reproduced image of Long’s work, something we learn from the other print actually is “owned” by the Tate Museum in London. The second print, a much narrower shape that formally mirrors Long’s line, features an email chain between Casey James Wilson and Tate Museum staff culminating in the museum sending a high-resolution, printable file in exchange for the payment of £100. The two prints are outlined in black, mounted without frames, and include a color calibration strip along the left edge, alluding to the digital printing process which gives visual, material form to immaterial code. 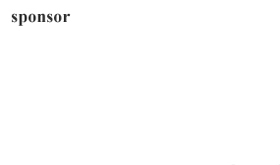 In the email chain we learn that Wilson paid for the rights to the digital image with a credit card (with details redacted) and that the Tate “deleted all reference to the cc details” and does not keep them on file. The shifts between erasure and drawing that were part of Long’s original gesture extend to the conceptual, economic, and linguistic layers of A Line Made by Growing, unwinding and rewiring the circuits of object, image, information, and capital created by the institutional cooptation of Long’s ephemeral artwork. C.M. Turner’s curatorial statement claims that all four works in The Wired “breakdown the boundary between the corporeal works and the digital space of the online realm.” While all works incorporate these divergent types of images and objects, two did so mostly by means of simple juxtaposition. The two installations by Hodges and Wilson, however, examined the circuits of exchange and layers of meaning in the spaces between art object, documentation, and simulation, elevating the exhibition from a rumination on the relationship between digital and material realms to a conceptual meditation on the visual and material lives of art works in the digital age. The Wired is on view at the Alice F. and Harris K. Weston Art Gallery until April 2.